No false modesty, I genuinely wasn't expecting to win. Not this year. My team and I were fully prepared to come a very respectable second. 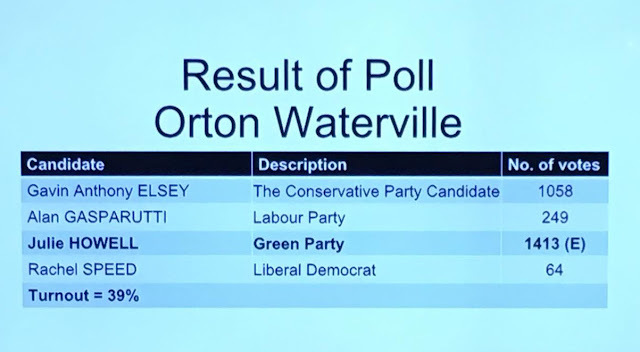 So when the voters of Orton Waterville ward elected me as your new city councillor with more than 50% of the vote we honestly were lost for words. 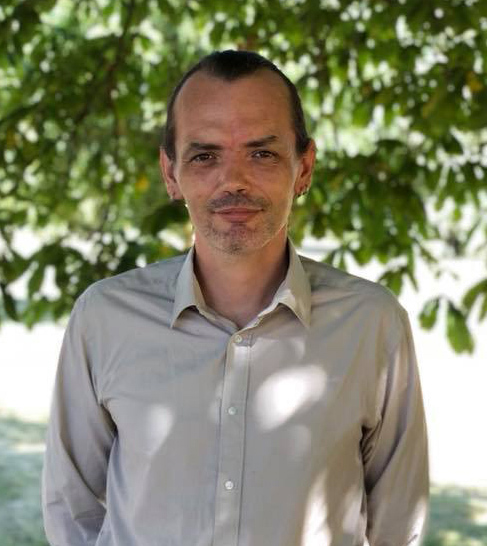 Elections are really difficult to win, especially if you're in a small local party with very little in the way of resources and have never won a seat in the city before. 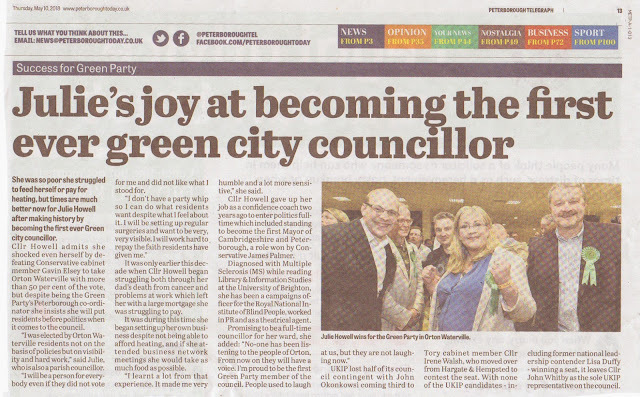 What's more, a week prior to the election our hallowed local paper the Peterborough Telegraph said that all sitting Conservatives were expected to keep their seats. No one said anything about the possibility of a historic landslide win to a Green Party candidate who had never won an election before. Look! A little sliver of green! Hard work and high visibility. 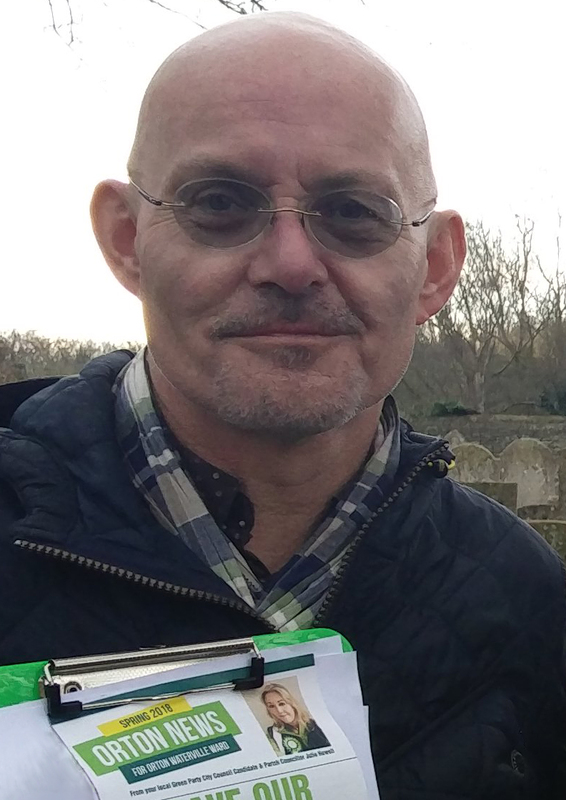 In the last couple of weeks leading up to the election we knew we were doing okay as high numbers of residents were telling me and my team that I am the only politician who knocks on their door throughout the year and the only local politician who takes the trouble to communicate with them. 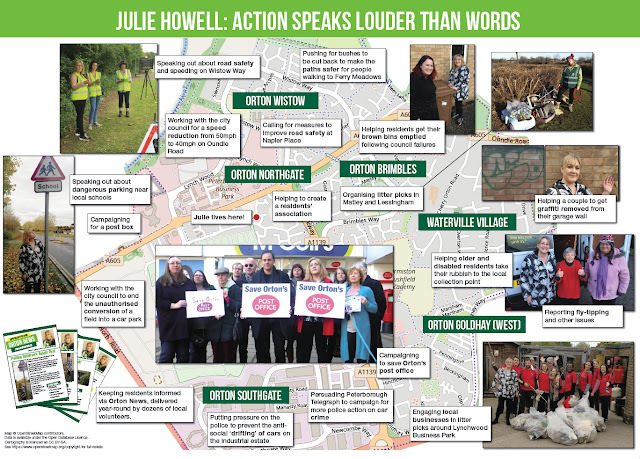 For me, communication is obvious and important - I just didn't realise just how important it was to Orton Waterville residents, nor how rarely the other local politicians were doing it. 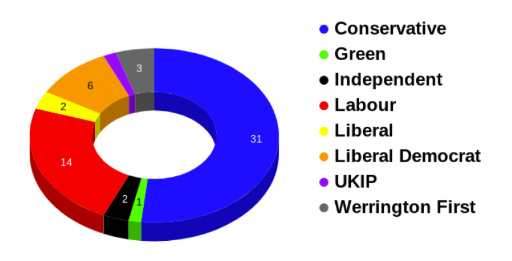 Another reason for the win was undoubtedly the large turnout of 39%. This may not sound like a very high number, but compared to other wards in the city it is impressive. We can put this down to many people deciding to vote in this election who usually would not and many of these people deciding to vote Green. Residents used to joke that you could stick a blue rosette on a potato in Orton Waterville and it would win. I don't believe that any seat should be 'safe', so my team and I worked hard for over two years to offer residents a genuine alternative. I thought we'd do okay, but I did not expect to leap from an 8% share of the vote to over 50% in a single election. That caught us all by surprise. And then there are the issues. I'm not talking about Green Party policies. 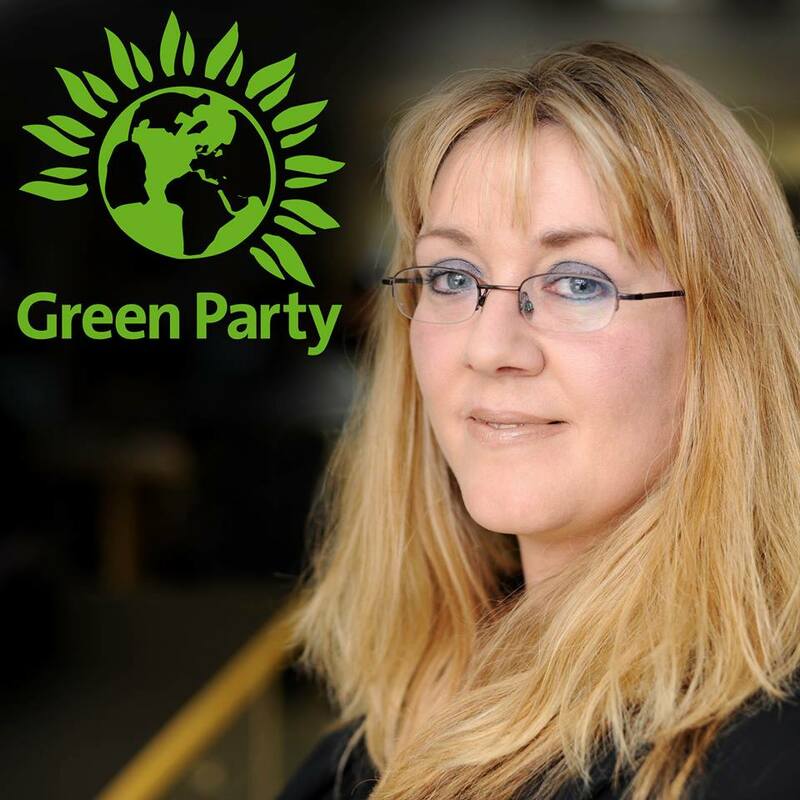 In the Green Party we don't have 'the whip', unlike the other big parties. This means I'm free to speak my mind and to represent my community as I choose. So the issues I'm talking about are the ones that are important to you: the survival of our local post offices, the condition of our roads, fly-tipping, the accessibility of local buses, etc. Because I talk to you over and over I understand what is important to you and have already taken action on many of the issues that concern you. That's about the size of it: hard work, high visibility and offering a genuine alternative (and independent) voice. Those were the three things that inspired the residents of Orton Waterville ward to make history in Peterborough by voting in the first Green Party city councillor that we have ever had. I can't tell you how honoured and humbled I am. My team and I were utterly bewildered by the result. We expected to come second. We really, really did. Elections are won by a hard-working team with a strategy and strong leadership and I can't tell you enough good things about my amazing team. To put sufficient resource behind Orton Waterville meant withdrawing resource from campaigns elsewhere in the city and that is a big ask to make of party members who have been selflessly campaigning in their wards for many years. 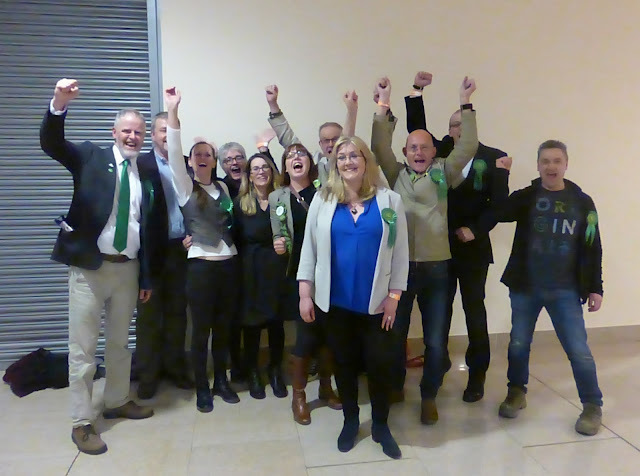 It takes real sacrifice on the part of many candidates (we stood candidates in all 18 wards this election) to ensure the return (or near return, which was our expectation) of just one councillor. My team wholeheartedly got behind me and gave me, and you, everything they had. You've met many of them when they've been out delivering my leaflets or knocking on doors for me. They're amazing and I could not have done this without them. The same goes for our many volunteers, residents just like you who deliver my leaflets in their own streets. So many of you championed me and ensured the success that became our new reality on election night. You put posters in your windows, you talked about me to your friends and family members. You turned the tide towards my win. I am so humbled by everything that you did. Humbled and inspired. Thank you. I've fought this election campaign for the past two years as if I was already your ward councillor. This means that you can expect from me what you've already grown used to: hard work, high visibility, regular communication. The main difference now is that I have greater access to council resources. If you thought I was effective before I was elected, just wait to see what's coming. I can hardly wait. My driver is to serve you. This is now my full-time job. My party wants me to be independent so I'm free to represent you the way you wish to be represented. I enjoy knowing many of you and being in constant touch with you. None of this will change now that I've been elected. In fact, expect to see me in your community more and more. Thank you - I've led a full and rich life with many ups and many downs. But this has made me so proud and I can't wait for what's to come. Together, we'll make Orton Waterville ward an even more wonderful place to live. 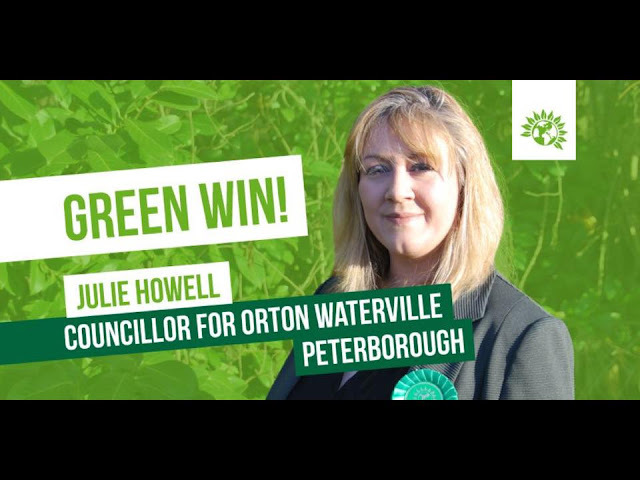 What a splendid post Cllr Howell! Highly in keeping with the historical event itself; the first Green Party councillor in our town, ever. It is such an exciting and great privilege just to take a part in the story. I too cannot wait to see how it is going to unfold from here. Congratulations to all of you dear people! Thank you Goran. Your support throughout the campaign has been incredible.